04/08/2019 – Nostradamus: Trump assassination, War & Hard Brexit !!! 04/08/2019 – Threat of nuclear war cannot prevent WW III forever !!! 03/23/2019 – The Ancient astronauts Theory !!! 03/10/2019 – Is Our World a Simulation ? Some scientists say it’s more likely than not ! 02/15/2019 – Edgar Cayce : “The hope of the world is in the hands of Russia” ! 01/27/2019 – US will go to war to stop emergence of petro-yuan ! 01/07/2019 – World War III is coming ! WHY WORLD WAR III COULD HAPPEN IN 2019 ! Throughout the past year(s) events have been taking unexpected twists and turns. Let’s recap. Britain has voted itself out of the European Union and continues to negotiate on Brexit. There is continuing conflict in Syria with a chemical attack on civilians outraging the world . President Donald J Trump then launched a US Tomahawk missile strike on a regime airbase. Then there’s North Korea pushing ahead with its ballistic missile tests and nuclear tests in its bid to become a nuclear power. In response Japan has carried out air attack drills and dished out leaflets on what to do should Kim Jong-un’s nukes rain down. Kim Jong-Un responded by reportedly telling its giant neighbour it would be a “piece of cake” to nuke Japan and leave it “blanketed in radioactive clouds”. ISIS is also being expelled from its so called Caliphate and its supporters are being encouraged to lash out with lone wolf terror attacks. The jihadist atrocities in Manchester and London Bridge were two such examples of this carnage hitting the UK alone. Read The Full Article ! 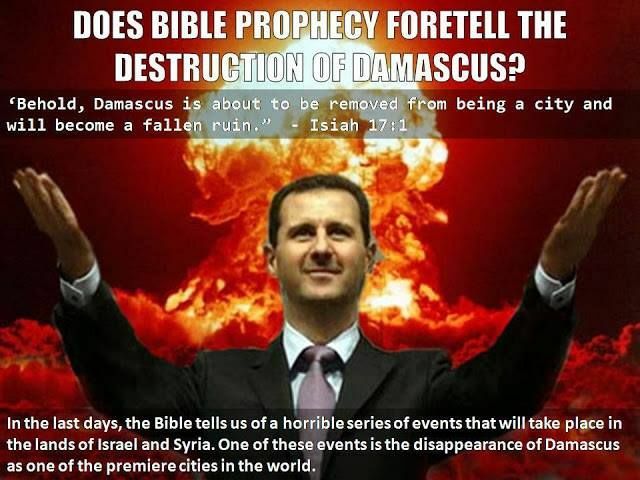 DAMASCUS WILL BE DESTROYED BEFORE THE END OF TIME ! Syria is almost a ‘city-state’ with much of its population living in and around the city of Damascus. Some historians and archaeologists believe Damascus may be the oldest continually inhabited city in the world and there is no record in ancient history of it ever being fully destroyed. Syria is also the home of many Islamic terrorist groups and its army invaded and has occupied Lebanon for almost 30 years. Currently, Syria (with Iran) is supporting the Hezbollah in southern Lebanon against Israel. Syria, like the rest of Israel’s Islamic neighbors hate Israel, have invaded and attacked Israel on several occasions, and have publicly called for the destruction of Israel. It is interesting to note that recently an Israeli general, on commenting on the growing threat of Syria, said the easiest thing to do to protect Israel from Syria would be to drop a nuclear bomb on Damascus. Read The Full Article ! ARE WE ON THE BRINK OF WORLD WAR III ? The rumors of wars has certainly begun as we have more and more political figures either stating WW3 is just around the corner or is already here. Has World War III already begun? WWI began with an assassination, WWII began with Hitler’s invasion of Poland. But WWIII could certainly start differently. As conservative talk show host Glenn Beck stated, WW3 is on the horizon and “nobody will recognize it yet.” Let’s look at a few of the prominent figures that warn us of WW3…. Check out the full article ! POPE FRANCIS I ELECTED “LAST POPE” ACCORDING ST-MALACHY ! NSA WHISTLEBLOWER : OSAMA BIN LADEN IS STILL ALIVE ! National Security Agency whistleblower Edward Snowden, has made a new controversial claim yesterday, saying that he possessed some classified information proving that Osama Bin Laden is still alive. Snowden, who lives as a fugitive in Russia after leaking documents about the NSA’s surveillance programs has made some previously unreported allegations about the famous terrorist, Osama Bin Laden, during an interview with the Moscow Tribune. Read the full article !